The Georgia Municipal Cemetery Association or GMCA is a United States domestic non-profit corporation in the state of Georgia chartered in 2007 to improve government service through municipal cemetery management. GMCA provides professional development opportunities, state-wide networking and organized support for the elected and appointed professionals over Georgia’s public cemeteries. Municipal cemetery managers from across the state of Georgia assembled at the Central City Park in Macon Georgia on October 9, 2007, summoned by email distributed through the Georgia Municipal Association (GMA). Representatives from the GMA, the Georgia Chapter of the International City/County Management Association (ICMA), and the Georgia Department of Natural Resources (DNR) Historic Preservation Division (HPD) were present at the meeting to support the conception of the Georgia Municipal Cemetery Association (GMCA). The association was chartered by general consensus of more than 50 individuals representing more than 30 municipalities geographically distributed across the state of Georgia at that initial meeting. Stan Rogers of Rome, Georgia, who had initiated the email campaign, was selected to chair the planning committee and Vince Evans of Gainesville, Georgia was selected as vice chair. Several other municipal cemetery managers volunteered to serve on the planning committee. Several members of the planning committee met at the Ramada Conference Center in Augusta, Georgia on November 1, 2007 and drafted proposed bylaws for the association. Jerry Flemming of Savannah, Georgia was subsequently appointed Interim Treasurer on November 21, 2007. Articles of Incorporation for the Georgia Municipal Cemetery Association (GMCA) were filed on December 11, 2007 by Rogers, Evans and Flemming. Preliminary membership requirements were established and the Association had 65 members prior to a meeting held in Macon, Georgia on March 6, 2008. At that meeting, the general membership of the GMCA elected four officers and three directors. Stan Rogers, Vince Evans, Jerry Flemming and Debbie Cripe were elected President, Vice President, Treasurer and Secretary, respectively. Harold Smith of Cave Spring, Deborah Abraham of Columbus and Kathy Cummings of Cordele were elected Directors. The general membership also approved bylaws for the Association at the meeting on March 6, 2008. The bylaws were subsequently amended by the General Assembly on May 28, 2009, November 7, 2009, and November 7, 2012. Also at the meeting on March 6, 2008, Margaret Hollingsworth of Rome, Georgia was authorized to establish an official website for the association and Lauree San Juan of Savannah, Georgia was authorized to develop an electronic periodical on behalf of the association. A state map of Georgia was prepared highlighting the home cities of the membership illustrating participation from all regions of the state. 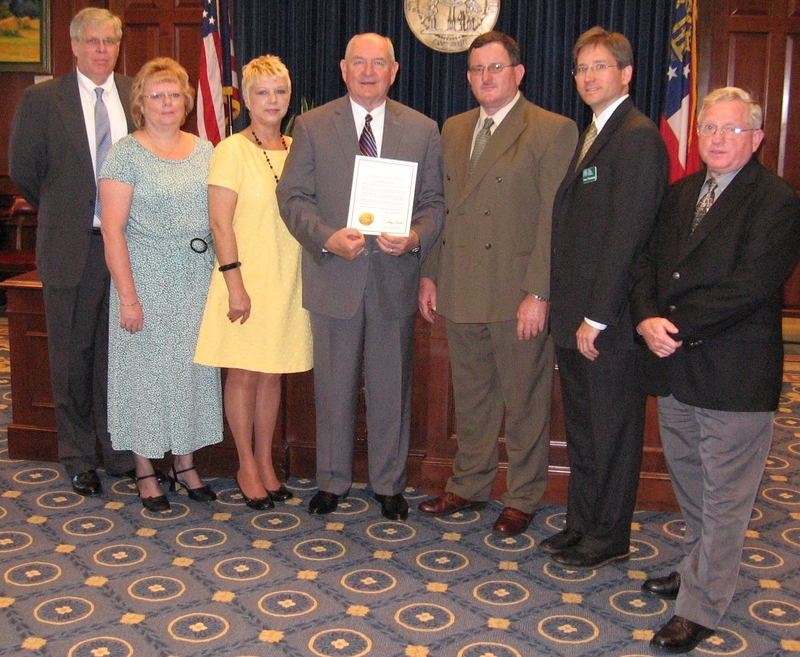 On April 9, 2008, the officers and directors of GMCA met with Georgia Governor Sonny Perdue at the State Capital in Atlanta, Georgia. The Governor presented a commendation to GMCA and GMCA presented Governor Perdue with honorary membership to the association. The officers and directors also visited Oakland Cemetery in Atlanta following a devastating tornado and performed a damage assessment. Later, the association provided financial and technical assistance to the Oakland Cemetery Foundation for cemetery restoration. The first major conference of the association was held in Savannah, Georgia on June 12-13, 2008. GMCA partnered with the National Center for Preservation Technology and Training (NCPTT) to provide classroom training and a hands-on workshop on “the basics of cemetery preservation” to municipal and nonprofit cemetery professionals from across the state of Georgia. The training was provided in Laurel Grove Cemetery in Savannah by Jason Church of NCPTT who was formerly employed by the City of Savannah Department of Cemeteries. Annual conferences have since been held in Rome (2009), Columbus (2010), Savannah (2011), Decatur (2012) , Thomasville (2013), Augusta (2014) and St. Marys (2015). The GMCA adopted a strategic plan on June 11, 2008, which remained in effect until a revised strategic plan was adopted by the executive committee on April 11, 2013. The strategic plans included a purpose (or mission) statement, goals, objectives, and strategies for the association. Many of the strategies were short-term and have been completed while many others are long-term and will remain in progress for years to come. Following the Savannah Conference, the GMCA divided the state into regions and appointed regional representatives. Eventually, the three at-large directors were replaced by a director from each of the eight regions. Regional representatives scheduled organizational meetings in their respective regions. Regional workshops have been held in Columbus (2008), Douglas (2012), Elberton (2008 and 2013), Gainesville (2008 and 2010) and Sandersville (2008 and 2009). GMCA partnered with the Georgia State Historic Preservation Office (GASHPO) to provide 4 additional daylong cemetery conservation workshops across the state of Georgia (Columbus, Decatur, Gainesville, and Sandersville). The association developed a professional website (www.GMCAweb.org) and published quarterly electronic newsletters, Around Hallowed Grounds, in 2008 to keep the membership informed, network with technical experts, and educate volunteers and staff who work in Georgia's public cemeteries. The association has since experimented with social media to reach more potential members. Representatives of the association met with the Georgia Chapter of the American Public Works Association (APWA) on St. Simons Island and with the Georgia Recreation and Parks Association (GRPA) in Columbus in an effort to reach more municipal cemetery managers. The general membership of the GMCA approved a professional code of ethics in November of 2013. The GMCA will diligently strive to encourage the highest ethical practices in the operation, maintenance, and management of Georgia cemeteries. The purpose of the Georgia Municipal Cemetery Association is to encourage and provide educational and networking opportunities for municipal cemetery and non-profit foundation managers, personnel and volunteers, and to protect and promote Georgia’s historical cemeteries through conservation, restoration and tourism. In doing so, the association remains true to its charter to improve government service through municipal cemetery management. GMCA continues to provide professional development opportunities, state-wide networking and organized support for the elected and appointed professionals over Georgia’s public cemeteries.